[F.O.]. The Law-French Dictionary Alphabetically Digested, Very Useful for All Young Students in the Common Laws of England. 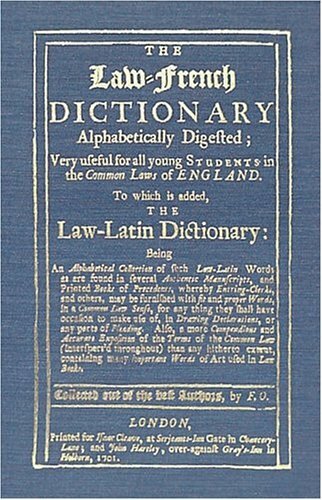 To Which is Added the Law-Latin Dictionary: Being an Alphabetical Collection of Such Law-Latin Words as Are Found in Several Authentic Manuscripts, and Printed Books of Precedents, Whereby Entring-Clerks, and Others, May be Furnished with Fit and Proper Words, in a Common Law Sense, for Any Thing They Shall Have Occasion to Make Use of, in Drawing Declarations, or Any Parts of Pleading. Also, A More Compendious and Accurate Exposition of the terms of the Common Law (Interspers'd Throughout) Than in any Hitherto Extant, Containing Many Important Words of Art Used in Law Books. Collected Out of the Best Authors by F.O. London: Printed for Isaac Cleave and John Hartley, 1701. Two Volumes in one, each with title page. Unpaginated (646 pp.). Reprint of the first edition. This landmark work was the first dictionary written to aid lawyers in the translation of the Year Books, old deeds and other early documents. Each definition carries one or more references to examples in works by such authors as Brook, Coke, Crompton, Fitzherbert, Littleton and Plowden. The second part is a Latin dictionary that aimed to assist attorneys in the drafting of pleadings. Brand: Brand: The Lawbook Exchange, Ltd. If you have any questions about this product by Brand: The Lawbook Exchange, Ltd., contact us by completing and submitting the form below. If you are looking for a specif part number, please include it with your message.